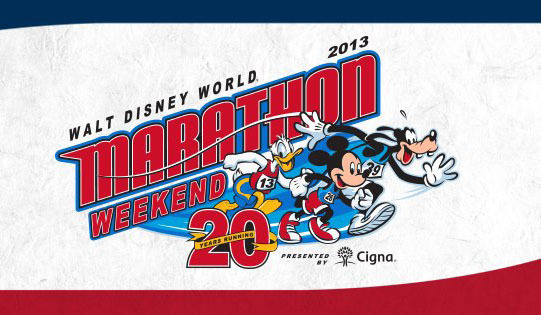 The Disney World Marathon in January is one of my favourite Run Disney events to do. 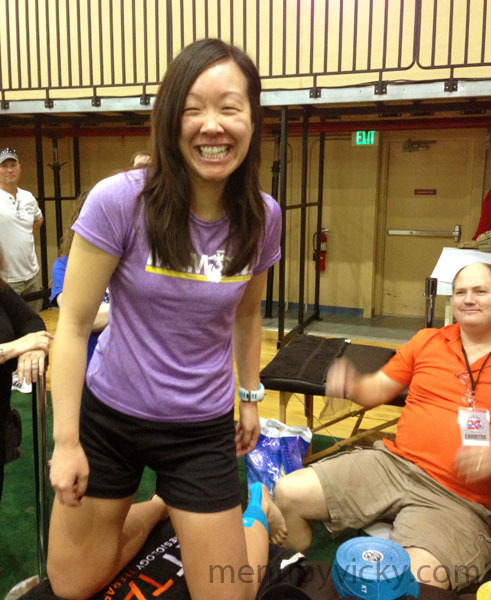 This year, I had signed up for the Goofy Race and Half Challenge which involves running the half marathon on Saturday and the full marathon on Sunday. I arrived at Disney World late Tuesday evening and spent the next few days hanging out with friends and relaxing before the race. Thursday morning, several of us headed over to the Health and Fitness Expo at the Wide World of Sports to pick up our bibs and do a bit of shopping. I met up with Rebecca from Rapunzel’s Adventures and we headed straight to the expo. Big thanks to my friends Paul, John and Janie for saving us a spot in line! We decided we’d go shopping first, priorities you know! We wanted to make sure we got everything that we wanted to buy. 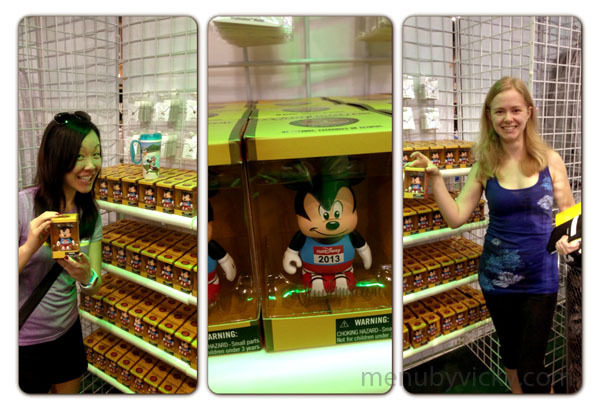 I believe that Rebecca did get the first Vinylmation figurine from the shelf! Next, I wanted to get my problematic Achilles Tendon taped by KT Tape; I had been having an unusual ache and wanted to have it taped up before running on the weekend. The line was short and I waited about 10 minutes before it was my turn. Rebecca’s boyfriend grabbed a picture of me while I was being taped. 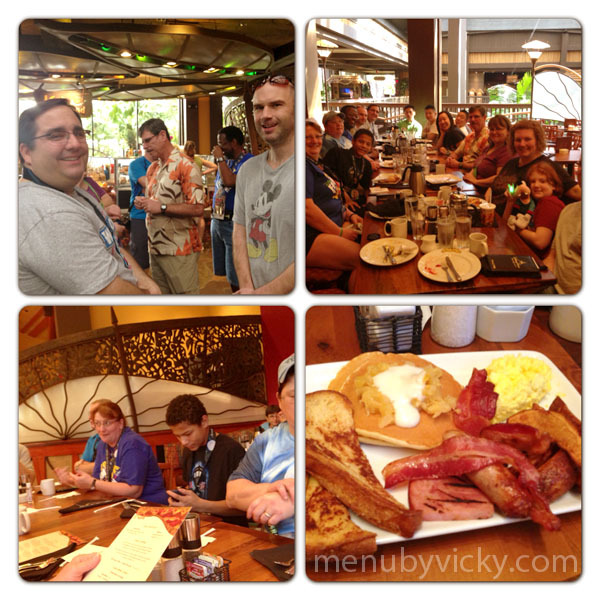 Friday morning, we had our first mini group meet at the Kona Cafe in the Polynesian Resort. There were about 17 of us there and we had a great time carb loading on tonga toast, pancakes, talking about the upcoming races and just hanging out! 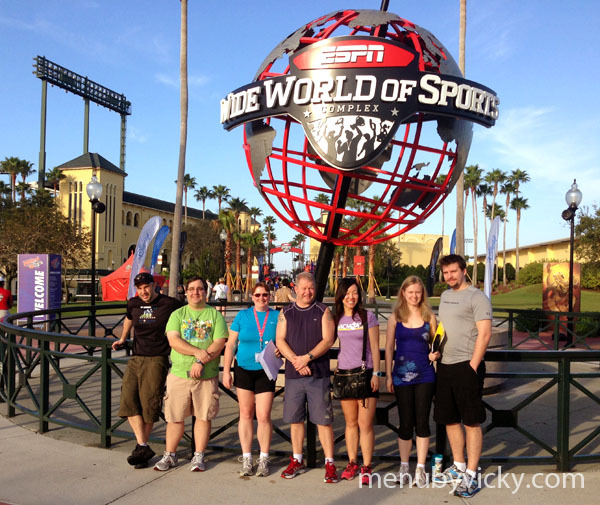 Shortly after breakfast, a few of us headed over to Magic Kingdom to go on a few rides. At least that was the plan. Unfortunately, we got stuck on Pirates of the Caribbean for more than an hour. To top things off, our boat stop right in front of a water cannon where we got sprayed with water every two minutes for more than 40 minutes. Not good. 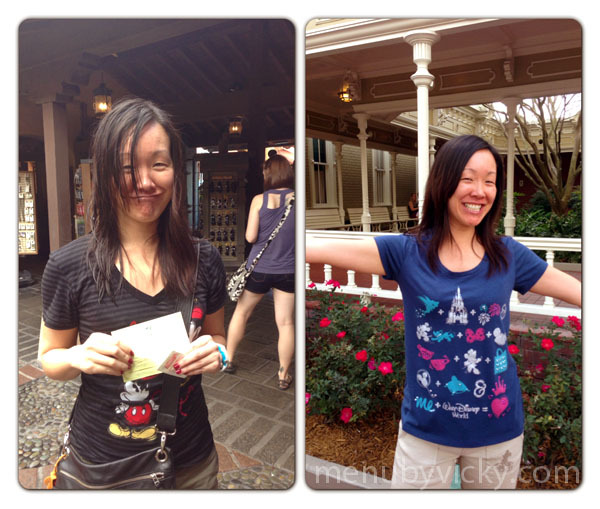 I ended up completely drenched but Disney was nice enough to replace all of my clothing. I couldn’t believe that I used a park ticket for one ride – worst use of a ticket ever but not much I could do about that. We had enough time to quickly shop for replacement clothes and grab a snack before heading back to our resort for another team meet up and an early dinner. I laid out my running gear for the next day, packed my gels, made sure my watch was charged and that I was in bed by 10:00PM. Saturday morning started E-A-R-L-Y! I was up just after 2AM and I quickly got showered, dressed and ate. I always have trouble eating quickly in the morning and I fell behind schedule. I texted my team that they should get on the buses without me because I was late. I got out to the bus stop 10 minutes late and I was surprised to see that they had all waited for me! I was happy that we would get to head over to the race together. Once we arrived, we took a group photo with the team. A couple of us had dressed in costume and I thought it would be fun to get some pictures. Rebecca was Belle from “Beauty and the Beast, Rick was Woody from “Toy Story” and I was Venellope Von Schweetz from “Wreck it Ralph”. The costumes were Rebecca’s idea and I’m glad she suggested them. They didn’t require a lot of extra effort but we had people cheering for us by our real names and by the characters we were dressed as. After the photos, we headed our separate ways. We first had to go through the checked bag tents before we could make the long trek from the pre-race start area over to the start line and corals. 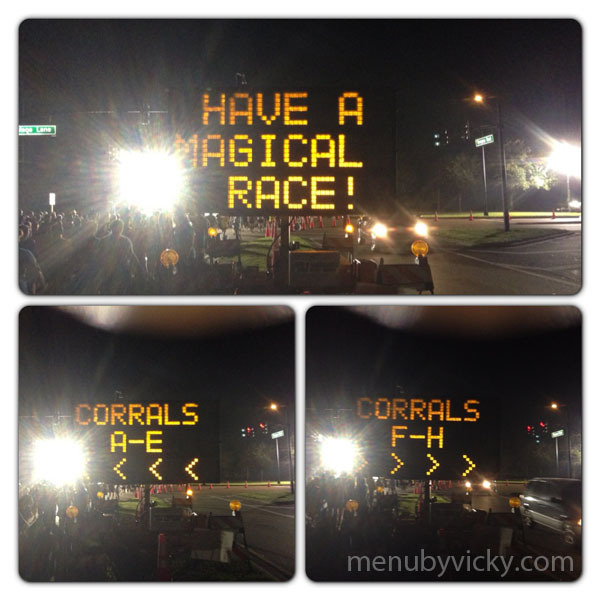 Though the race has a start time of 5:30AM, runners generally start the walk over to the corrals around 4:30AM. Many people have asked me if the walk is really that long to the start line. The answer is no but in order to move more than 20,000 people at the same time, you do need to get going early. This morning was no exception as the the “walk” more or less resembled a crawl. It felt like we would walk two steps, stop, take two more steps and then another two steps. I think it took us a good 45 minutes to walk maybe half a mile but we made it with enough time to spare for a good 10 minute warm up session. This morning, I would be running with my friend Rick Peete from Runs2Live. One of the things I love about my team is being able to run with friends as I do a majority of my training runs solo. I think it’s a real treat to be able to run with a friend and to share in their accomplishments. 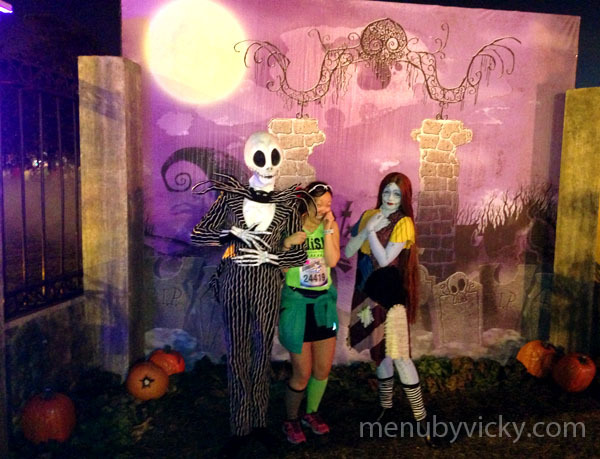 This would be Rick’s first Goofy and I was thrilled to be running it with him. After warming up, Rick and I made our way into corral B and waited for the race to begin. The wheelchair athletes started at 5:30AM followed by runners in Corral A. 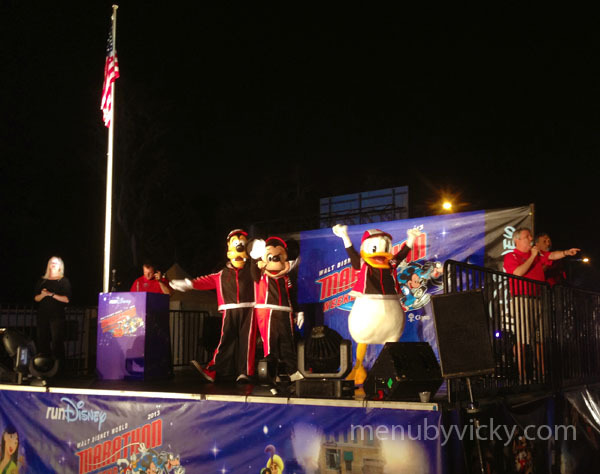 Finally it was our turn – we were given a welcome by Donald Duck, an awesome display of fireworks and we were off! 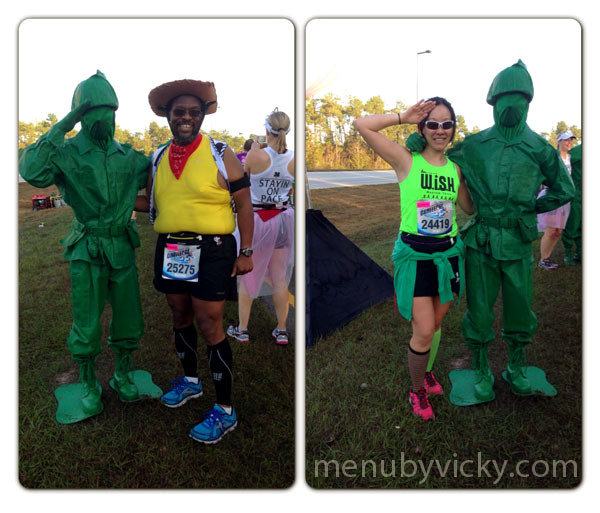 The Goofy Challenge is different than running your typical race. 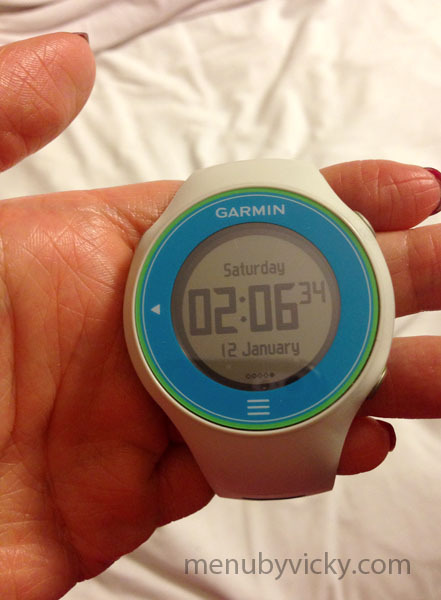 There are many strategies for tackling the 39.3 miles over the two day period. Some go all out for the half while others will walk. I felt it would be best to conserve our energy for the second day where we would have to run a marathon distance of 26.2 miles. I asked Rick if we could do intervals of four minutes running and one minute walking along with walking the water stops and stopping for any characters either one of us liked. He agreed with my plan. I also wanted to go easy as I didn’t want new injuries or to re-injure my Achiles before Sunday. The course for the Disney World Half Marathon takes runners from the roads just outside Epcot up and into the Magic Kingdom and then back around and into Epcot where runners cross the finish line just outside of the park. 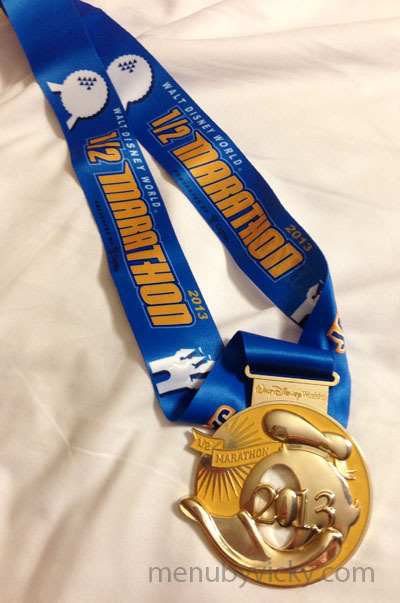 The course itself is mostly flat except for two small hills – one outside of the Contemporary Resort and the second before you re-enter Epcot, just before mile 11. My favourite part about Disney races is that they provide a lot in the way of entertainment – there are high school bands, live puppeteers, creative signage and of course the characters. All the distractions just made the time and miles fly by. 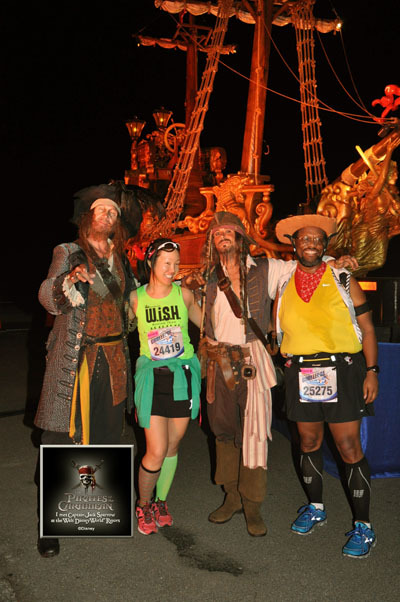 Just before reaching mile 3, we came across our first character stop – The Pirates of the Caribbean. I asked Rick if he wanted to stop and he said yes because this was one of the photos he had been looking forward to. The line was about 15 people deep but it moved quickly and we were on our way again. 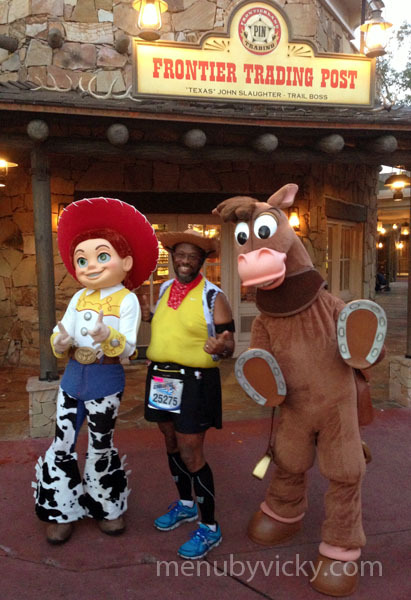 Shortly after the course wound through the Magic Kingdom parking lot, it was my turn to ask if we could stop for another character photo. Jack Skellington and Sally from ‘A Nightmare Before Christmas’ were both out and I was excited, never having seen them in the parks before. Other people in line were also excited and Rick and I chatted while in line to make the time pass. We both got our pictures and were soon back on course running. After that character stop, we made our way through the Ticket and Transportation Center, up World Drive, past mile 5 and entered the Magic Kingdom. The course took us up Main Street USA, through Tomorrowland and through Cinderella’s Castle. We saw a few more characters here including Buzz Lightyear, Donald and Daisy, Belle and the Beast, Alice and the Queen of Hearts, Princess Tiana but the characters I knew Rick had to stop for was Jessie and Bullseye. I think it was one of the best photos we took all race! 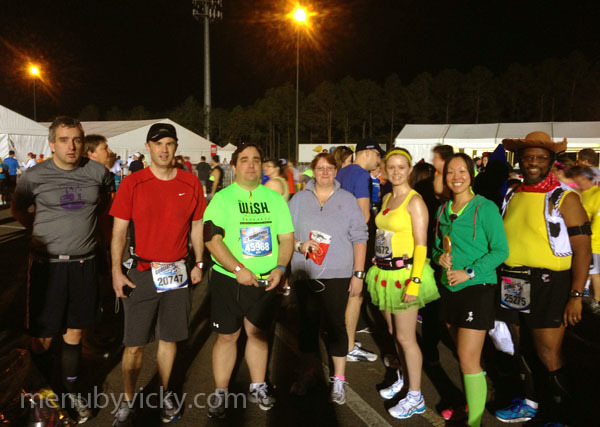 We were now on our way headed back to the finish just having passeed through the backstage area of Magic Kingdom and the marker for mile 7. We made our way down past the Grand Floridian resort, the Magnolia golf course and the Polynesian resort. Here, I spotted my friends Diana and Susan cheering on runners. They gave me a big smile and wave as I ran past! By this time the sun was out and the temperature was rising. I noticed that Rick was slowing down. He asked if he could walk for a bit – we took things easy so that we could give his knee a break and bring his heart rate down. We made two more character stops since the lines were short. 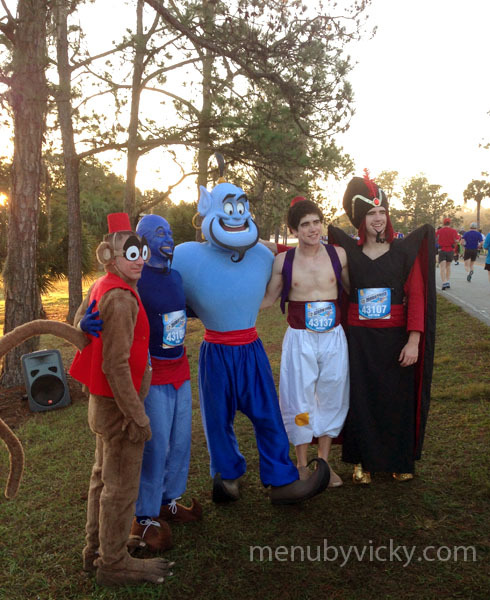 The first was for Genie from ‘Aladdin’ and just ahead of us, a group of runners were dressed like characters from the movie. I grabbed a quick picture of them since I loved how they coordinated costumes. Next, we stopped for the Green Army men from ‘Toy Story’. I don’t think Sarge was out because no one was yelling for pushups but there were several soldiers out making the picture lines go quickly. We made our way down the road, back toward Epcot and the finish line. I snapped a few more pictures during our walking breaks – I snapped pictures of the signage for mile markers 12 and 13, and the gospel choir just before mile 13! 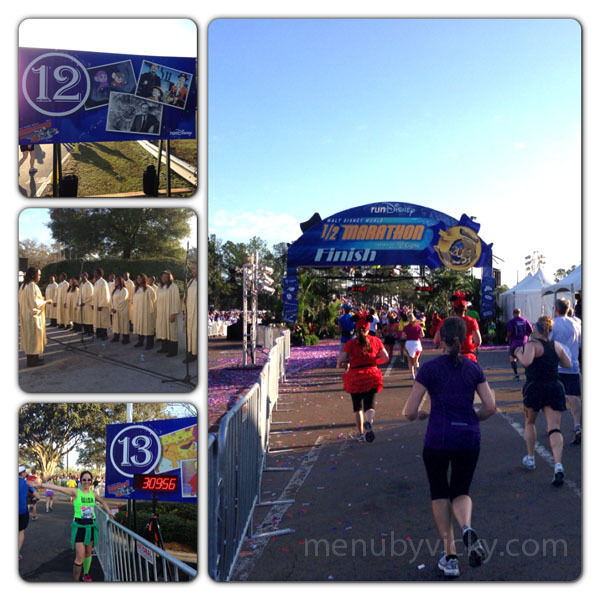 Miles 12, the gospel choir, mile 13 and the finish line! I finished the half in 3:01:02 and I didn’t feel tired or winded in spite of the heat and humidity nor was my Achilles pinching or hurting in any way. I felt like I was in good shape to continue onto the full the next day! I think I was more hot than anything else. I quickly made my way to the med tent, grabbed a bag of ice for my knee and headed to the food tent. This year, Disney was handing out pre-packaged boxes of food instead of the usual bagels, bananas and cookies from previous years. 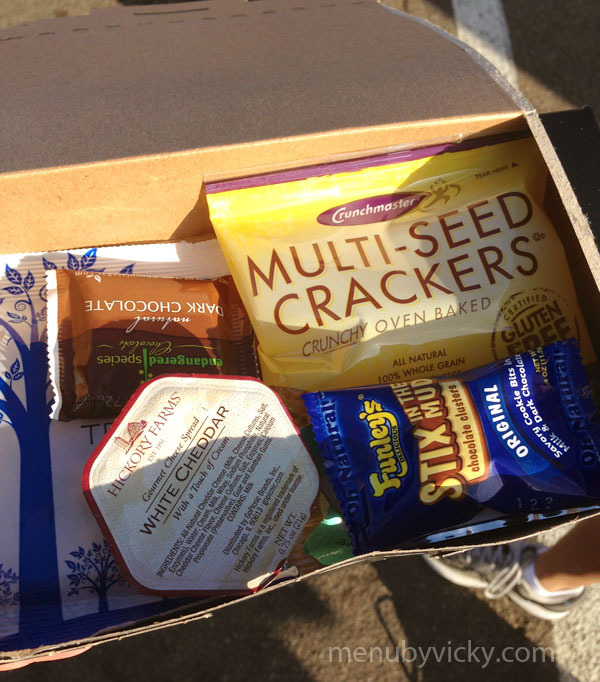 The box contained some crackers, spreadable cheese, a small pack of trail mix and a Clif protein bar. My thoughts on the course are generally positive. I loved running through Magic Kingdom up and through the different parts of the parks. There were plenty of porta potties and well-stocked water stops. I loved being able to stop to take pictures with characters but the one thing I found difficult to deal with this year were the crowds. 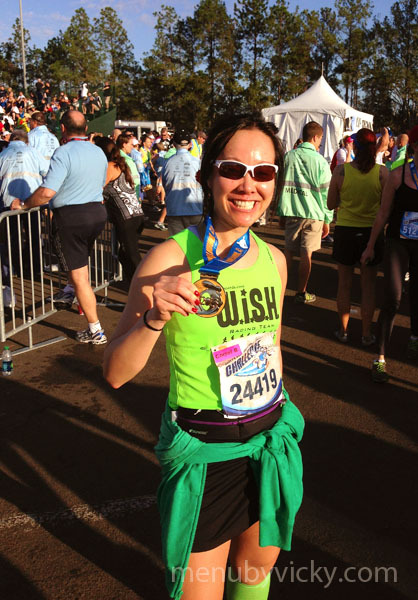 With more than 20,000 participants out that day, the course never really thinned. 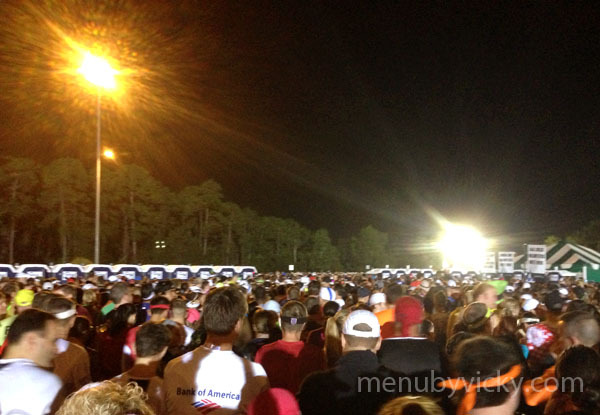 In fact, there were so many runners out this year, traffic came to a complete stop while running through the castle. Some people were stopping to pose for pictures in front of the photographers instead of running through the castle and down the ramps. This was causing a backlog of runners. It was so humid that even the signs were sweating! The heat and humidity also made the race uncomfortable. 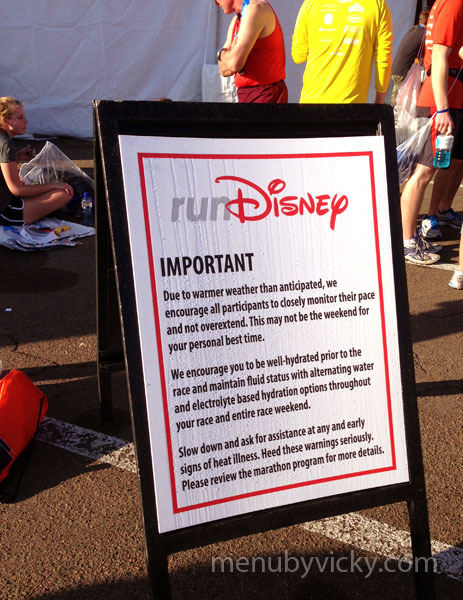 The heat was so much of a concern that Disney even posted signs warning runners of the dangers and suggesting that this would not be the race for a personal best. I was glad that Rick and I decided to go at a slower running pace. Other than that, I had a great time and was looking forward to running the full the next day. Stayed tuned for part II! Awesome, Vicky! Love seeing the race from someone else’s perspective! Kona Cafe is on of my fave places to eat at Disney! Love all your character pics, cute!